Mardi Himal Base Camp Trek is newly opened and less crowded trek located in east of Annapurna Base Camp. It is nearest base camp trek became one of the most popular destination in Nepal for the excellent and close view of Mardi Himal (5587m), Annapurna South (7219m), Hiunchuli (6441m) and fishtail/Machhapuchhre (6993m). 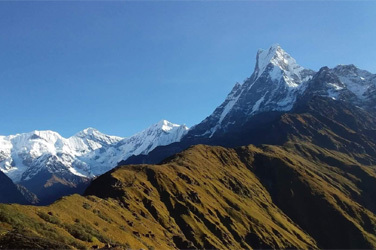 Mardi Himal Base camp trek route offers total wilderness, massive landscape, daily life style of local indigenous community and dense alpine forest. Still this area you are not getting fancy hotels and Teahouses means only available basic Homestay and teahouses facilities. It is easy Base Camp trek compared to other Base Camp treks of the country, suitable for those who love to experience the beauty of flora and fauna, stunning views, walk through thick jungle with dense Rhododendron forest and even more beautiful in Spring. Mardi Himal Base Camp trek is the perfect trekking trail to the real trekking enthusiast who wants to escape from crowed and dive into the peace of Nature. The hardest point of Mardi Himal Base Camp Trek is going from High Camp to Mardi Himal Base Camp (4500m). It is a tough 6 hours trek over the rocky mountain terrain. Altitude and mountain sickness is not really a problem on the Mardi Himal Base camp trek as you won't be at a high altitude for very long. Many people from all walks of life, ages and fitness levels have done this trek. After breakfast drive back to Kathmandu, which is takes about 7 hours' drive. On the way you can enjoy the scenic views of villages, rivers, mountain ranges and many more.